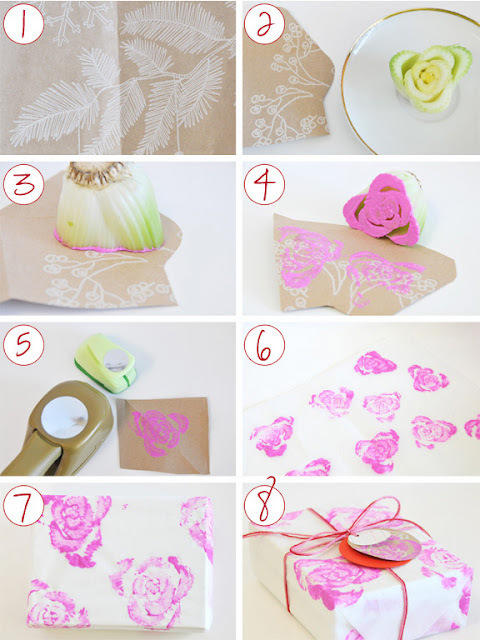 In Honor Of Design: Embellish Your Gift Wrap! Who would have thought....the base of celery stalks makes the perfect flower?! Brilliant! I love any form of DIY packaging...For the detailed instructions, visit here! That is fantastic!! I love creature comforts DIYs, they are always so creative. That is such a great idea -- who would have thought?? super creative!!! that's my kind of recycling :) great idea! With so many weddings this summer, i'm going to totally try that out! thanks for the idea, Anna! WOW this is an amazing idea!! at first i was thinking that i needed to go out and buy a stamp... but then i saw that this was from CELERY! how clever!! now i just need to go buy ink hehe! I go to Creature Comforts for her DIY often as well and your DIY's are pretty awesome too. These celery stocks sure make beautiful flowers. I love seeing what your working on! I didn't know that you do blog design too! What don't you do?! Not a lover of celery. But wow, seriously the stems of it definitely made some very awesome flowers and very pretty gift wrap. So simple yet brilliant! what a great, great idea! thanks for sharing!!! Hope you are having a fab day! This is one of my all time favorite DIYs.. it's just incredible!! Thanks so much for featuring my project here on your beautiful blog! What a wonderful surprise. So cute - I love this idea! I love creature comforts diy's, they are always so creative, and easy too! i love that site!!! it's my go-to as well :) lovely! omgosh, brilliant! seriously, who would have thought?? lol! thanks for sharing, anna! That is so creative! What a great idea. Seriously this is genius, I never would have though of this- what a fantastic idea!! I NEED TO BE A BETTER BLOGGER! PERIOD! BECAUSE I LOVE LOVE LOVE YOUR SITE! You are so creative! The stamps on the gift wrap idea = AWESOME!